My local library had a little display of travel books on my last visit that got me to thinking that many people are beginning to plan their Christmas and Summer travel. So I thought I’d begin a bit of a series I’ve been planning about travel, mainly travel with kids. Here’s the first post. Several years ago at a charming morning tea with my mother’s group, one of the mothers mentioned a fancy suitcase she had bought for her toddler. ‘What on earth would a toddler want with a suitcase?’ I thought to myself. But then she expanded. This suitcase was a sturdy four-wheeled contraption that the child could ride on. Safely. My heart skipped a beat. Cute and functional luggage? Truly, it’s what my dreams are made of. In a matter of weeks I had hunted down and purchased our very own Trunki. I say ‘our,’ even though technically it was for the toddler of the household. I was pleased as punch with our delivery and still am after several years and many travels. By far, my favourite feature of the Trunki is that a toddler or a preschooler can ride on board and be dragged along. Never was I more thankful for this feature than when we faced a long walk across the tarmac after a four hour flight. Obviously, the dragging must be done slowly, but it’s a hell of a lot easier than carrying the child. Especially when you have another babe in arms! (Or sling, as the case may be). Trust me, it’s sturdy and it works (see the video evidence here). In summary, the kid straddles the case and hangs onto the ears while you pull the strap. The proportions of the case give it a relatively low centre of gravity and a shape that distributes the weight of the child riding. The ride-on feature also provides a good form of entertainment in stop-overs (lay-overs) or at the hotel, and appropriate seating when waiting in those inevitable long queues. Love it. I thought you said it was a suitcase? 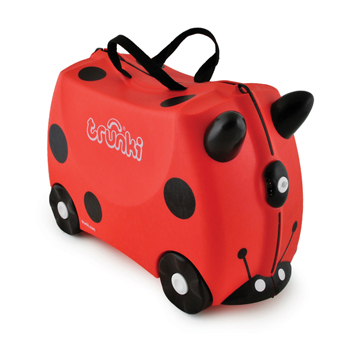 A Trunki is made from very sturdy plastic, like that used on many hard-cased pieces of luggage. So even if you decide to check it in, you probably don’t have to worry about it coping with the beating of traveling in the hold, though this is not recommended by the manufacturer. Inside there is a small pocket, that I honesty didn’t find that useful and one side has straps like many ordinary suitcases. The size (l 46 cm x w 20.5 cm x h 31 cm) and weight (1.7 kg) mean that it’s also fine to take on board, as you may have gathered from my tarmac story. It held more than enough clothes for a little one on a two week trip, including some nappies. Not much else though. Look at it! I want a case like that too. We received a lot of attention in airports, mainly from adults. This was likely due to the ride-on capabilities, but also because Trunki cases are available in all kinds of adorable get-ups (see more here). We have two, one is made to look like a tiger the other looks like a bee. Tiger stripes and bee stripes?! Bloody fantastic. 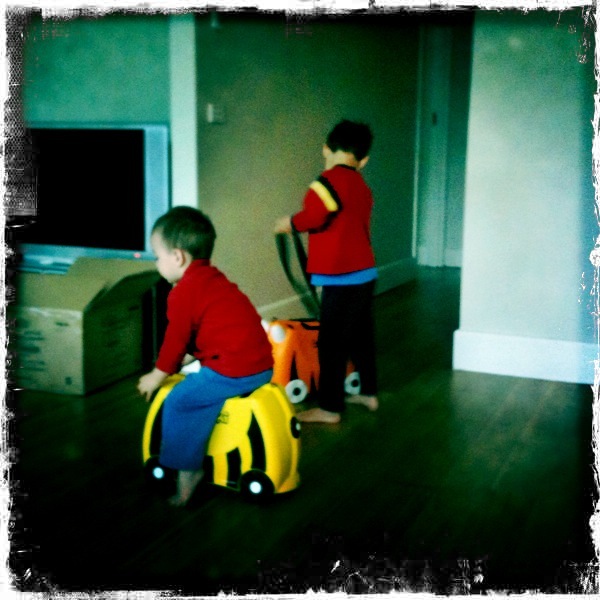 Our Trunki cases in action at home. So, it’s totally awesome? Not quite. The Trunki was difficult to drag around compared to other types of luggage, even without a child riding on board. The flexible strap, sturdy shape, and especially the fixed wheels, work against the Trunki when you’re in a hurry or if you want to turn a corner. Our kids were able to drag it around most of the time, without much assistance, from an age of about three. We’d occasionally give it a kick to take a corner or just give it a really big tug around an obstacle (like when you’re dragging the vacuum cleaner about the house). Sometimes we’d even resort to dragging it ourselves or clipping the strap to carry it over our shoulder. Carrying it over the should is also awkward because of it’s shape. Another problem I’ve faced more recently is the smaller size. My dream is to be able to always travel with carry-on only. Even with kids. We have done it using the Trunki cases, but it would have been easier if the kids had bigger cases that were easier to maneuver. Your child can ride on it. Your child can pull it, by themselves. The thing is like, totally adorable! Awkward to carry and maneuver. Maybe too small for your needs. Do you have a Trunki? What’s your experience with it? Trunki cases are available in Australia online at theluggageprofessionals.com.au and haggusandstookles.com.au. For more information also see trunki.com.